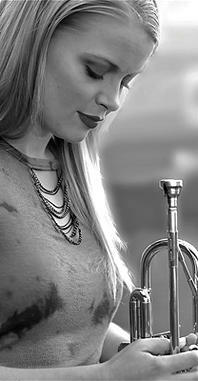 The Bria Skonberg Quintet is scheduled to take the stage at The Lincoln Theatre on Friday, October 10th at 8pm. If you missed the singer and trumpeter in “Bravo Benny” with the Columbus Jazz Orchestra in March or at Natalie’s Coal Fired Pizza in July, then here’s your chance to be enlightened again. The show is the second in the 2014-15 Inside Track series from the Jazz Arts Group of Columbus, and will feature a workshop before the show with Bria and her band talking about how jazz has changed over time and her meteoric rise to the top of the hot jazz scene. Considered to be a jazz virtuoso, Bria Skonberg’s versatility as a jazz player has been put to the test as a bandleader and guest performer at more than 50 festivals and clubs spanning the globe. Her travels have lent an influence of multi-cultural jazz and world percussion to her solo work. So Is The Day, her second solo album and her U.S. debut, has a cast of celebrated guest features. Skonberg is revered by fellow artists often lending a hand in tribute shows, such as her work with Wycliffe Gordon (who appears on So Is The Day) on the “Hello Pops” tribute to Louis Armstrong. Into Your Own, Skonberg’s third and newest solo composition, was released in early May and has dazzled jazz fans everywhere with a sound which she can truly call her own.